Lynch syndrome is a genetic condition associated with an increased risk of cancer. Lynch syndrome is formerly known as "hereditary nonpolyposis colorectal cancer syndrome" (HNPCC). Individuals with Lynch syndrome are more likely to develop colorectal, uterine cancer, and other types. The cancers are also more likely to occur at a younger age than usual. Although Lynch syndrome is primarily associated with colorectal and uterine cancers, it has also been associated with an increased risk of ovarian cancer and cancers of the small intestine, urinary tract, hepatobiliary tract, skin, and brain. The condition is caused by a mutation in one of the mismatch repair (MMR) genes: MLH1, MSH2, MSH6, or PMS2. 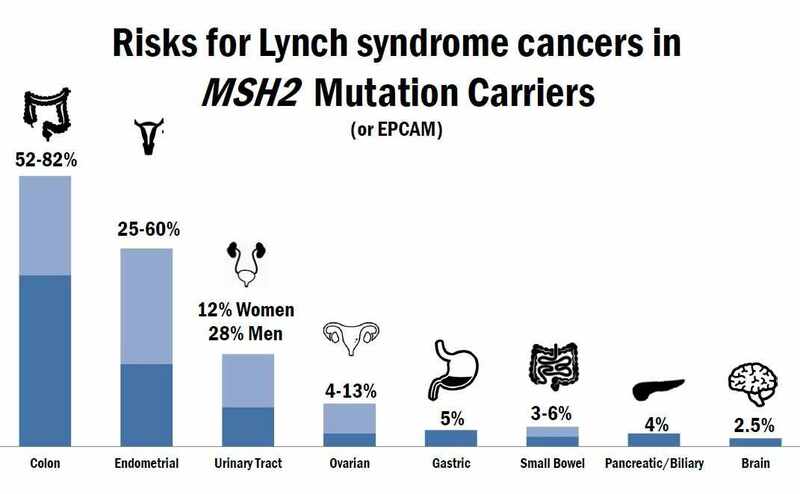 Mutations in EPCAM can also cause Lynch syndrome as EPCAM is connected to MSH2. The MMR genes are like spellcheckers, they repair errors that occur when DNA copies itself. However, when the spellchecker itself is broken, the DNA doesn't get corrected, and more and more errors start to accumulate in the genetic code. Several hundred mutations in the MMR genes that predispose people to colorectal cancer and other Lynch syndrome-associated cancers have been found. These mutations may cause the gene to produce abnormal protein or no protein at all. When this happens, the gene cannot perform its normal function. When the mismatch repair protein is absent or ineffective, the number of mistakes that are left unrepaired during cell division increases substantially. If the cells continue to divide, errors accumulate in the rest of the DNA, and the cells become unable to function properly and may form a tumor in the colon, endometrium or another part of the body. Lynch syndrome is the most common form of hereditary colorectal cancer. The prevalence of Lynch syndrome is estimated to be approximately 1 in 370. This means that approximately 1 out of 370 people are affected with Lynch syndrome. Lynch syndrome is a hereditary condition caused by a genetic change called a mutation. There are four major genes involved in the development of Lynch syndrome: MLH1, MSH2, MSH6, and PMS2. 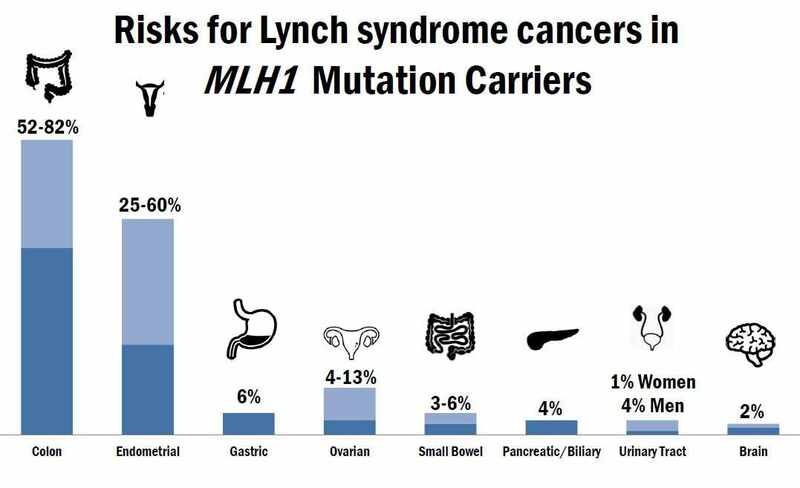 The majority of cases of Lynch syndrome are the result of mutations in either the MLH1 or MSH2 genes; however, mutations in the MSH6, PMS2, or other genes can also cause Lynch syndrome. An inherited mutation in one of these genes means that the body is not able to properly repair DNA. Put simply, there is a mistake in a gene that normally helps prevent cancer—which is why Lynch syndrome is associated with a higher risk of some cancers. In 2009, a new gene—EPCAM—was discovered to cause Lynch syndrome. Although it is not one of the mismatch repair genes (MLH1, MSH2, MSH6 or PMS2), it does cause the MSH2 gene to not be expressed. Individuals with EPCAM mutations often have colon or endometrial tumors that show a loss of the MSH2 and MSH6 proteins. Additionally, genetic testing for the MSH2 and MSH6 gene will be negative, meaning no mutation found. It is estimated that 30% of individuals who have a loss of MSH2/MSH6 in their tumor and have negative gene testing for MSH2 and MSH6 have a mutation in EPCAM. What are the chances of inheriting Lynch syndrome? There is a 50 percent chance that a person with Lynch syndrome will pass the mutation on to their children. 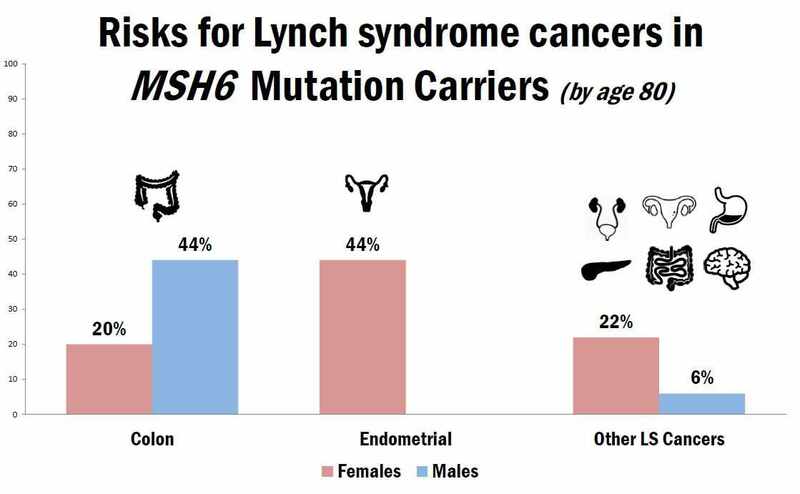 Lynch syndrome does not skip generations and it affects males and females equally. This is called autosomal dominant inheritance. To read more about inheritance click here. Here’s how it works: Every person has two copies of each of the four Lynch syndrome genes—one copy inherited from the mother and one copy inherited from the father. An inherited mutation in either of these copies will cause Lynch syndrome. In other words, someone who has one normal Lynch syndrome gene and one mutated Lynch syndrome gene will have Lynch syndrome. 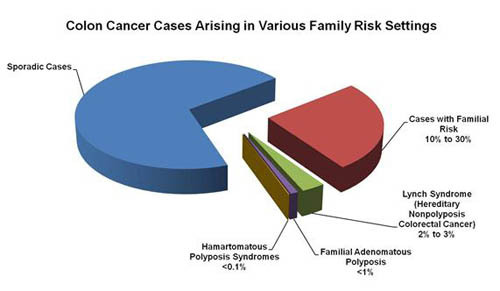 When someone with Lynch syndrome has a child, he/she may pass on the normal gene or the mutated gene—meaning that the child has a 50 percent chance of either a) inheriting the Lynch syndrome gene mutation, which means an increased likelihood for developing colorectal or uterine cancer or b) inheriting the normal gene, which means an average risk for developing cancer (the same as the general population). Lynch syndrome is not a guarantee of developing cancer, but it does increase a person's risk. Colorectal Cancer: Individuals with Lynch syndrome have a higher-than-average risk of developing colorectal cancer and they tend to develop it at a younger age. The average lifetime risk for developing colorectal cancer is approximately 6 percent; however, individuals with Lynch syndrome have a higher lifetime risk and their average age at diagnosis is about 45 years. Some data indicates that the cumulative colorectal cancer incidence for those with Lynch syndrome (all mutations) is 82 percent. Individuals with Lynch syndrome also have an increased risk of developing a second primary colorectal cancer. If you have questions and would like to speak to a genetic counselor about Lynch syndrome please either contact the Kintalk UCSF genetic counselors or you can find a cancer genetic counselor near you on the National Society of Genetic Counselors or the NCI Cancer Genetics Services Directory. 1 de la Chapelle A. 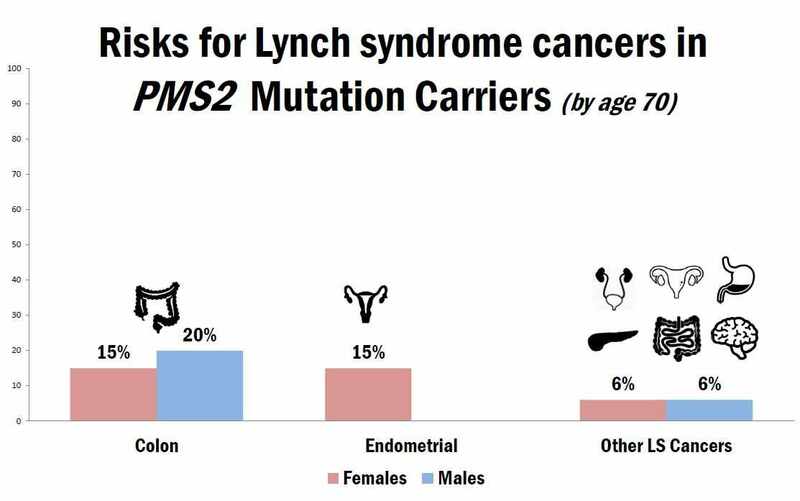 The incidence of Lynch syndrome. Familial Cancer. 2005; 4(3): 233-7. 2 Lynch HT, de la Chapelle A. Hereditary Colorectal Cancer. New England Journal of Medicine. 2003; 348:919-932. 3 Aarnio M, Sankila R, Pukkala E, et al. Cancer risk in mutation carriers of DNA-mismatch-repair genes. International Journal of Cancer. 1999; 81(2): 214-8.